Paul Wolfowitz engaged in nepotism when he assured that his girlfriend, Shaha Riza was promoted and saw to it that she received a hefty pay increase, one far exceeding the standards set by the World Bank. And what does Wolfowitz (with the aid and comfort of George W. Bush) do? He thumbs his nose at the World Bank. 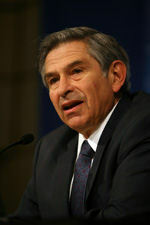 Wolfowitz called the findings “unbalanced and flawed” and argued that the panel had omitted statements and documents that support his position. The fact that the United States official position is to continue to offer Wolfowitz continuing support is another sign that the Bush White House is simply out of touch with the realities of the US position vis-a-vis the rest of the world. Bush and Wolfowitz seem to believe that they can play at being the playground bully doing whatever they please. 37 country directors on the front line of the bank’s operations said in a letter to the board and to Wolfowitz that the leadership crisis had damaged the bank’s reputation and effectiveness in fighting poverty. In refusing to accept responsibility, Wolfowitz displays a profound lack of ethical character. This denial is the height of arrogance in the face of resounding criticism of Wolfowitz’s actions. The Committee said:The Group finds the submission notable for absence of any acceptance by Mr. Wolfowitz himself of responsibility or blame for the events that transpired. WASHINGTON (Reuters) – A World Bank committee found bank President Paul Wolfowitz violated ethics rules in his handling of a promotion and generous pay rise for his companion and his involvement represented a conflict of interest. Wolfowitz rejected the critical report on Monday and the United States showed no sign of yielding in its steadfast support for the former U.S. deputy defense secretary, saying the findings were no grounds to dismiss him. “Mr. Wolfowitz’s contract requiring that he adhere to the Code of Conduct for board officials and that he avoid any conflict of interest, real or apparent, were violated,” the panel said of Wolfowitz’s handling of a pay and promotion deal for World Bank Middle East expert Shaha Riza in 2005. The panel said Wolfowitz believes the blame lies with others and not with him. It said he did not accept the bank’s policy on conflict of interest and tried to bypass rules that he believed did not apply to him.